Landing on this page means that you are likely planning your retirement. While it might sound like an ordinary thing to do, most people don’t pay nearly as much attention to their future as they should. Granted, thinking too much about the future does distract from the present. Yet, after spending more than half a century studying and working, isn’t it time to pass the torch to the next generations and enjoy your retirement ages? A key component in this plan is having the money to live an enjoyable life. But picking the right retirement plan can be confusing. In this post, we are aiming to simplify things and help you make a more informed choice. Let’s begin with explaining the general features of each of the three most popular retirement saving plans—Traditional IRA, Roth IRA, and 401(k). A traditional individual retirement account allows you to save for your future days without needing an employer which makes this a great option for the booming freelancing community. You make an individual contribution with pre-tax money, and you get to choose the type of investment that would fund your contributions. Traditional IRAs, however, limit your investment options to more traditional types of securities. To go beyond that, for example, if you’d rather invest in real estate, you’ll need a self-directed IRA. How about limits? Can you contribute as much as you’d like to a traditional IRA? That’d be great, wouldn’t it? You place after-tax dollars in your IRA and then your investments grow tax-free. Sadly, IRAs come with a limitation which encompasses all IRAs you hold. You can contribute up to $6,000/year if you are under 50 years old and $7,000 if you are over 50. The limit is subject to change and depends on whether your adjusted gross income and whether you file your taxes separately or jointly with your spouse. The deal is—the more you make, the less you can contribute, to the point that some people with higher earnings are not eligible for an IRA. As of whether you should contribute to the max? If you can afford it, it’s better to maximize your IRA contributions. So, what’s the deal with taxes and withdrawals? With a traditional IRA, you can deduct your contributions from your taxable income provided you meet the criteria for adjusted gross income and employer-sponsored retirement plan. As per the IRS “If neither you nor your spouse is covered by a retirement plan at work, your deduction is allowed in full.” However, if you or your spouse are covered by an employer-sponsored plan (like a 401(k)) or your income exceeds certain levels, your deductions might be limited or null. As for withdrawals, you can begin using your IRA savings without incurring penalties, but paying income tax, after you reach 59 ½ years. If you are tempted to withdraw money from your IRA before reaching 59 ½, you’ll have to pay the income tax plus a 10% penalty on the money withdrawn. Early withdrawals might be exempt from the 10% fee if they are made as so-called “hardship distributions” which are covered here. By the time you retire, if you’ve managed your retirement plan wisely, your account might’ve grown to a decent size. You might be tempted to just let it grow and allow compound interest to do its thing to make you a rich person. The only thing standing in your way is that the government requires holders of IRA to start mandatory withdrawals—called “required minimum distribution”, after the age of 70 ½. So, even if you have other income sources to take care of you, after clocking in 70 ½ years you’ll have to take some money out of your account, and, yes, pay taxes on it. How much you’ll have to take out depends on a formula that involves the amount of money present in the account at the end of the preceding calendar year. A Roth IRA is also an individual retirement account but it differs from the “traditional” in that you contribute with after-tax dollars. This means that you can’t deduct your contributions but do get tax-free withdraws when you become eligible for distribution. 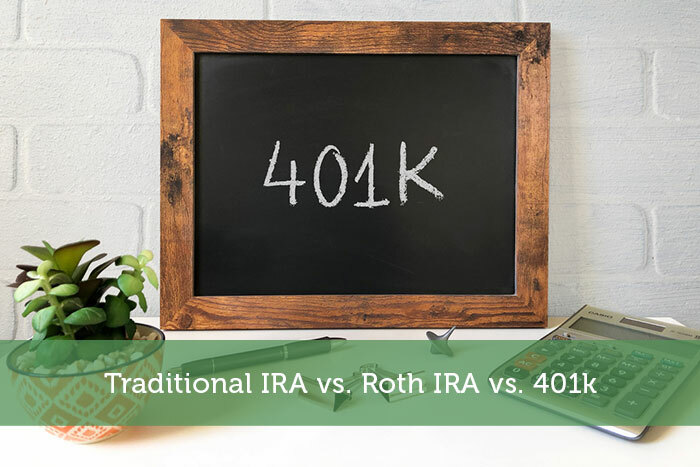 Like with their “traditional” counterpart, Roth IRAs allow you to invest in securities, and, again, if you’d like a more flexible option you can opt for a self-directed Roth IRA. As for limits, the same apply—up to $6,000 if are under 50 years old, and up to $7,000 if you are over 50. Also, you’ll be a subject to lower limits or be ineligible for a Roth IRA based on your tax filings. How about taxes and withdrawals? If you are under 59 ½, you can withdraw your Roth IRA contributions tax-free and penalty-free. The tax policy only applies to the amount that you’ve contributed—if you withdraw the interest accumulated on your contributions you’ll be subjected to an income tax. A possible exemption would be if you withdraw your earnings to help towards the payment for things such as a new principal home, medical expenses, or college education though limitations do apply. If you withdraw your earnings before the age of 59 ½, you might incur a 10% penalty. You can, however, avoid it and even use your account for early retirement if you follow this Roth IRA Conversion ladder. Roth IRAs also don’t come with required minimum distribution meaning the money can stay there until your passing. Like traditional IRAs, 401(k)s are funded with pre-tax money and thus are tax-deductible. However, instead of you making the payments, your employer deducts a sum chosen by you from your paychecks. Another area where 401(k) differs from IRA is that your investment options are limited by what your company offers you. Usually, the employer will have a contract with an investment brokerage. In 2019 you can contribute up to $19,000/year, and an additional $6,000/year if you are over 50 years old. The thing with 401(k) is that your employer might have a matching policy, meaning that the company matches a certain fraction of your contributions. Say, you contribute $10,000 and your company has a policy of matching 100% on the first 6%. This means that if you make $60,000/year and contribute $3600 (6%), your employer will contribute $3600 towards your plan. A 3% contribution will lead to 3% matching while a contribution of over 6% won’t lead to a matching sum of more than 6%. Total contributions can not exceed $56,000 or $62,000 for catch-up contributions. A 401(k) vesting schedule is a minimum amount of time you have to work for the employer before you can get access to its matching contributions. This only applies to the contributions made by the company, your contributions are yours no matter what. You can start withdrawing from your 401(k), and pay taxes on it, when you reach 59 ½ or after 55 if you are no longer working for your employer. If you withdraw early, you’ll be subject to income taxes and a 10% penalty. However, you can use your 401(k) as a line of credit without incurring a penalty. How much will depend on your employer and usually you can’t borrow from your company-matched funds—only the amount that you’ve contributed. What would happen with my 401(k) if I leave the company? If you leave the company that provides your 401(k) and want to transfer your money elsewhere, you can do a rollover to an IRA and keep them there or transfer them to a new 401(k). Can I have IRA if I have 401(k)? Yes, you can have both IRAs and 401(k) but in such cases (or if your spouse is covered by an employer-sponsored plan) your IRA tax deductions might be limited. Let’s sum up all of this and see how the three plans stack up against each other. So, which plan to choose? As in most things in finance, the answer is subjective and varies. Do you need help with contributions? When would you rather pay taxes—before or after retirement? Would you rather have flexibility in choosing how to invest your retirement plan? If you can’t provide satisfactory contributions, then a matched 401(k) might be your option. If you beleive that you’ll be in a higher tax bracket when you retire, then an after-tax Roth IRA can save you some money down the road. The opposite is true if you beleive that you’ll end up in a lower tax bracket after retirement. If you’d rather have a variety of investment options for your retirement account, an IRA account will provide the most flexibility. Other things such as the future political, economic, and financial environments in the country also matter, but they are hard to predict especially if you are decades away from retirement. Another option is to mix-and-match. You can have IRAs and a 401(k) and now there’s even a plan that takes the best of both worlds—a Roth 401(k). It’s still a 401(k) but you contribute with after-tax money, losing the tax deductions but getting tax-free money when you retire. Were you hoping to read a definitive answer about which retirement saving plan is the best? If only there was such a magical answer we would’ve been more than happy to give it. There’s not and each plan is unique in some way. While confusing at first, this is actually great for you—it means that you’ll have options should life come to surprise you.